Pharmacopoea Roterodamensis galeno-chymica, of Rotterdamsche galenische en chymische Apotheek, 1735. Last week, I attended an excellent workshop on Gems in Transit, organised by Michael Bycroft. In my paper, I discussed the slow but steady disappearance of gemstones from eighteenth-century medicine and pharmacy. 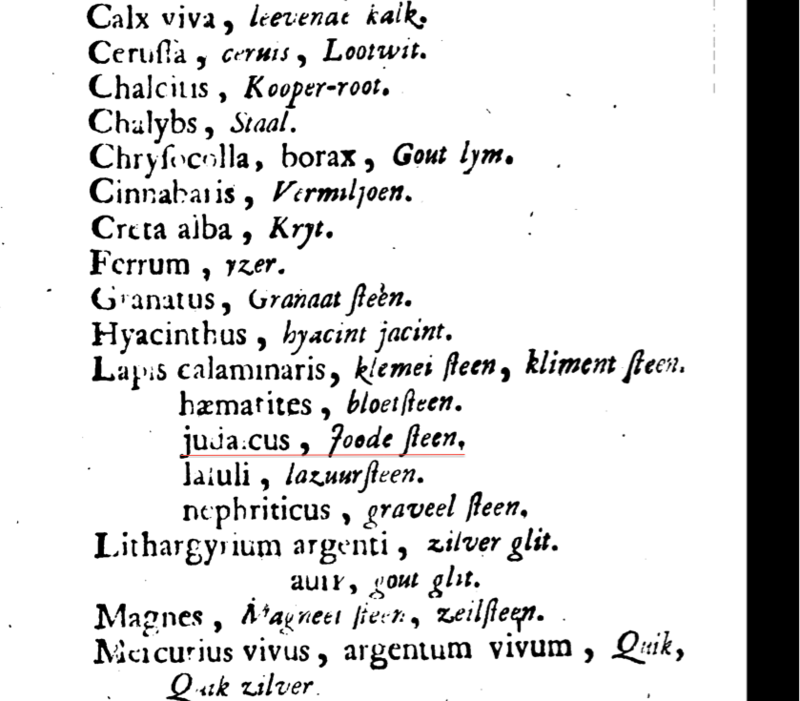 On one of my slides I showed a page from an eighteenth-century Dutch city pharmacopeia listing which minerals an apothecary should keep in his shop, to illustrate that gemstones were still a standard ingredient. One of the other participants, reading the list, asked me: “What’s Lapis judaicus or Jew’s stone?” Good question. I had assumed it was an iron ore, as it was listed alongside Lapis haematitis and Lapis lazuli – both metal ores in a sense, and as I was focussing on gemstones for this paper, I had not investigated it any further. 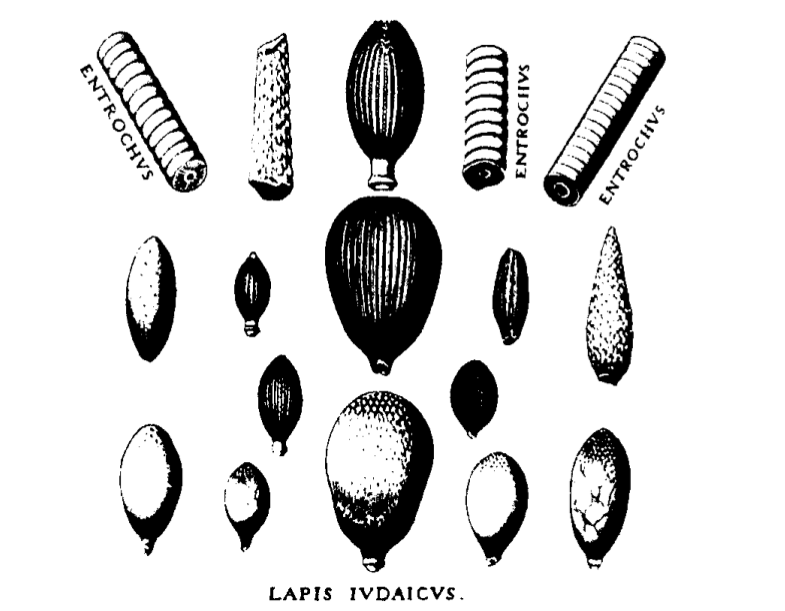 Jew’s stones and crinoid stems, depicted in Michaelis Mercati, Samminiatensis Metallotheca. Rome: Jo. Mariam Salvioni, 1717-1719. Yet now I was curious, and a quick search shows that Lapis judaicus is something different altogether: namely the spines of certain cidaroid echinoids (a sort of sea urchins), in particular the now extinct Balanocidaris, a kind of pencil urchin. Christopher Duffin has published an article on the history of the medicinal use of the Jew’s Stone, from which it appears that from Roman times until the eighteenth century, recipes circulated recommending the ingestion of powdered or shaved Jew’s Stone in water as a cure against kidney stones. He suggests that this was a case of sympathetic medicine, in which a cure is materially related to the condition it treats; i.e. animal eyes to cure an eye disease in humans, a dissolved, vaguely kidney-shaped ‘stone’ to dissolve kidney stones. The name Jew’s stone probably referred to Judea, were most of these fossils were found – although they occur around the entire Mediterranean. What surprised me even more though was that one of the first links I found was to a recent article in the Journal of Ethnopharmacology, which described a study in which patients with kidney stones were treated with 2 g of Lapis judaicus powder in hard capsules per day for 10 weeks. In total, sixty patients with kidney stones were included in the double-blind randomized clinical study. Thirty patients received the Lapis judaicus capsules and thirty others received a placebo for the same period. The size of the kidney stones reduced significantly in the drug group; in nine patients, the stone was even completely dissolved. Ethnopharmacology is concerned with the documentation of indigenous medical knowledge and the scientific study of indigenous medicines, or in this case rather historical medical knowledge and medicine, to contribute to modern medicine. This is not as far-fetched as it may seem – the Lapis judaicus study is not the only recent example of a historical pharmaceutical recipe that proved effective in clinical trial. Earlier this year, researchers at the University of Nottingham found that a medieval eye remedy containing onion and garlic killed MRSA bacteria. Although medical doctors were quick to point out that something that works in a clinical trial can be very hard to translate into an effective, commercially available drug, these cases suggest that historical pharmaceutical recipes may be more relevant for the present than we think. Duffin, Christopher. J. 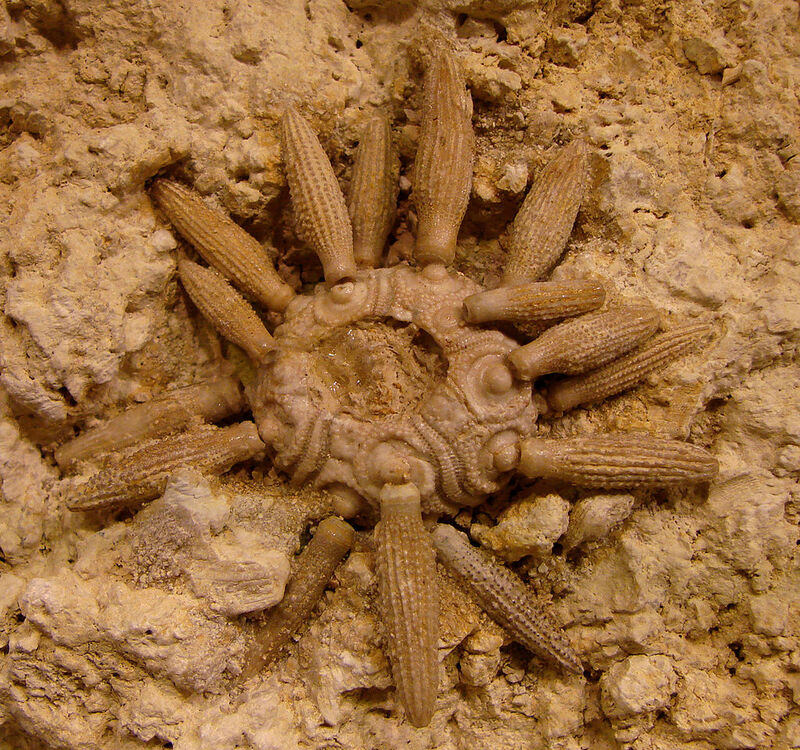 ‘Lapis Judaicus or the Jews’ stone: the folklore of fossil echinoid spines‘ Proceedings of the Geologists’ Association, Volume 117, Issue 3, 2006, 265–275. Faridi, P. et al, ‘Randomized and double-blinded clinical trial of the safety and calcium kidney stone dissolving efficacy of Lapis judaicus.’ Journal of Ethnopharmacology, Vol. 156, 28 October 2014, 82-87.